Autism Friendly Fridays – what are they? New for 2019, we’re offering ‘Autism Friendly Fridays’; special tree climbs in Appley Park for people who are on the autism spectrum. These will be one hour tree climbs for a maximum of four climbers at a time. The climbs will take place outside in the peaceful environment of Appley Park. Paul and Matt, our experienced instructors will lead the tree climbs and they are for anyone age 8 and over. Families and friends are welcome. Why is tree climbing good if you’re on the autism spectrum? The tree climbing technique we teach is repetitive. Instructions are clear and simple to learn. Once learnt, you repeat the same technique all the way to the top of the tree. We focus on supporting and encouraging individuals as they climb. There is no pressure to reach the top of the tree, or even half way. You don’t need to be super fit to go tree climbing. It’s a great way to boost self-confidence as many people achieve more than they expected – whether it’s overcoming a fear of heights or uncertainty about the whole experience. We’ve got alot of experience working with people with different needs. Goodleaf has been funded by the Isle of Wight Council as part of their Short Breaks programme since 2011. Short Breaks is a nationwide scheme that provides activities for young people with additional needs. As part of our Short Breaks training Matt and Paul have completed autism awareness courses. 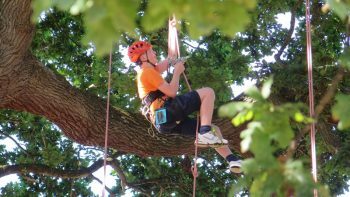 Why have a separate autism friendly tree climb? All our tree climbing is run on an inclusive basis. However, from customer feedback we know that some people on the autism spectrum struggle with a two hour session or feel uncomfortable in a larger group. Our climbers (or wannabe climbers!) have asked us to create a tree climb like this. Everyone is still welcome to book on a two hour session, we do always ask that you let us know if you have any additional needs in advance so we can make sure you have a great experience. Tap here to book or call 0333 800 1188. If you’re feeling uncertain about booking, please do give us a call. We’re happy to answer questions to help you discover if tree climbing is right for you. Cost is £18 pp for the hour for the climb and a piece of our ever popular Tree Climber’s flapjack.